Yaupon (from the Catawba Indian word yop, meaning "tree"), an evergreen shrub or small tree found on the coastal plain from Virginia to Texas and up the Mississippi Valley to Arkansas, made a popular tea in the North Carolina area during the colonial period. Its caffeine-rich leaves and twigs, toasted in earthen pots, were the most common botanical ingredient of black drink, a religious, medicinal, and social beverage used in many Indian societies, evidently as far north as the Great Lakes. 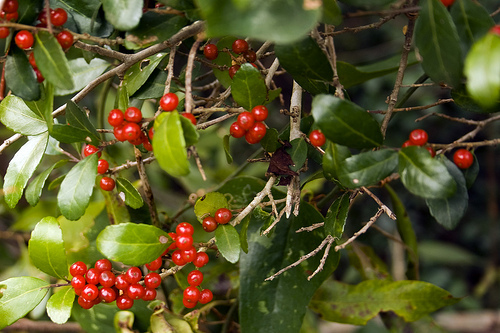 As the scientific name of yaupon, Ilex vomitoria, implies, Indians sometimes used black drink as an emetic, usually after adding seawater or other nausea-producing substances. A pure infusion of yaupon leaves is harmless, however, and many find its flavor pleasant. Settlers quickly learned of the stimulant and diuretic properties of yaupon and introduced it to Europe. By the early eighteenth century it had followed chocolate, coffee, and Asian tea from apothecary shops, which dispensed it as a treatment for smallpox and kidney stones, into aristocratic salons. Cured leaves sold for a half-guinea a pound in England, and for a time yaupon was an important export of the Carolina colony. English, French, Spanish, Portuguese, Italian, Dutch, and German had names for yaupon, more than two dozen in all. Yaupon was inexpensive and popular in the Carolinas and Georgia through the colonial period, but its association with the rural southern poor eroded its acceptability as demand increased for coffee, Asian tea, and (after the Civil War) carbonated soft drinks. The drinking of yaupon tea persisted on the Outer Banks until the early 1900s. Since then, government officials, home economists, and innkeepers have unsuccessfully tried to revive the practice for the sake of patriotism, frugality, or nostalgia. North Carolina's Yaupon Beach (Brunswick County), Yaupon Creek (Pamlico County), Yaupon Hammock Gut (Carteret County), and Yaupon Hill (Dare County) are named for the plant. Nancy Davis and Kathy Hart, Coastal Carolina Cooking (1986). Gary S. Dunbar, Historical Geography of the North Carolina Outer Banks (1958). Hudson, Charles M., editor. Black Drink: A Native American Tea. Athens: University of Georgia Press. 1979. "Ilex vomitoria, the Yaupon Holly," January 9, 2010, Kure Beach, North Carolina. Image from Flickr user Seuss. http://www.flickr.com/photos/90124154@N00/4260440051/ (accessed August 21, 2012).